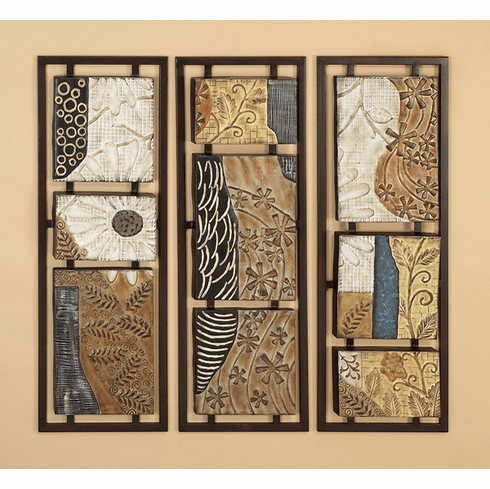 This is a very nice, high quality decorative metal wall decor set. Featuring abstract shapes & patterns hand-painted in various bold colors. Works well with many different themes of decor. This decor is very large, measuring approximately 36" high x 41" wide when spaced as shown (each piece is 13"W x 2"D). All pieces hang separately, so you can also space them apart on your wall or in different places in your space. Arrange them any way you want to - in a different order, upside-down, horizontal - whatever you like! Coloring may vary slightly since this set is hand-painted. Each piece hangs separately using 1-2 screws or nails (not included). * Dimensions: 38" x 15" x 7"